If you’ve never invited a Tyrannosaurus Rex to tea, clearly you’re missing out. 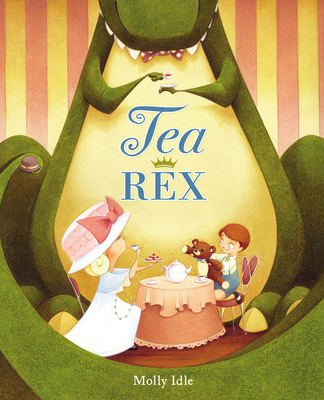 In Tea Rex, Molly Idle instructs young readers in the proper etiquette for a polite and dignified tea party: welcome your guest, offer a variety of tasty snacks, and engage him or her in conversation. Her illustrations depict two children — a dainty little girl in a giant hat and a little boy who fully appreciates the noisy joy of their guest — trying very hard to live up to the stated expectations while things get more and more out of hand. In the midst of happy chaos, there’s just the barest hint of a moral. If a guest needs to drink his tea from a giant hat and have room to swing his tail to be comfortable, good manners might be a lot more interesting than we thought. I loved the combination of dinosaur and tea party, and the casual presence of both brother and sister at the tea table. Tea Rex skips over stereotypes to tell a story that anyone can enjoy for its humour and its familiarity — who hasn’t planned something out and had it turn out terribly wrong just the same? Idle’s illustrations carry the weight of the story, and do so beautifully. Soft and colourful, full of activity and silly details, they strike a balance between gentility and playfulness that fits the tone of the story just right. Read more reviews from Three Books a Night and Publishers Weekly. 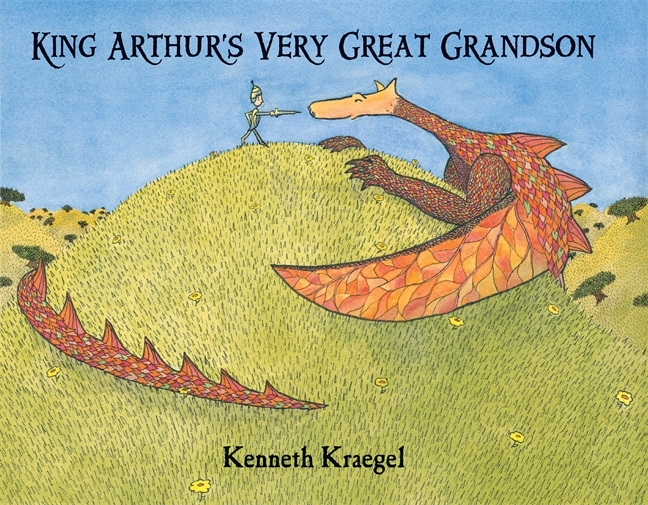 King Arthur’s Very Great Grandson, a 2012 picture book by Kenneth Kraegel, is an entertaining and gorgeously wrought tale of adventure and lessons learned. With each monster he meets — whether the fire-breathing dragon or dreadful Cyclops, the grim-faced Griffin or the ginormous Leviathan — Henry roars his manly challenge and prepares to battle his way to victory. Time and time again, though, the outcome is a far cry from what the valiant young knight was expecting, leaving him increasingly disgruntled. 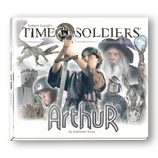 But ever so slowly, aided by mirthful monsters, King Arthur’s GREAT-GREAT-GREAT-GREAT-GREAT-GREAT-GREAT grandson begins to realize that perhaps fights to the uttermost are not the way to true victory after all. The colorful vocabulary and syntax, and the nuanced drawings of this picture book work exceptionally well together. Adventure is tangible here, but so too are important lessons around misconceptions (e.g., heroes versus bullies) and the value of friendship. 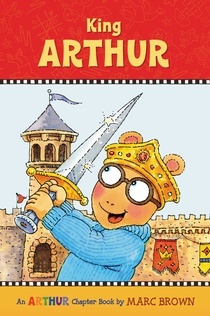 While Kirkus reviews the story as being appropriate for children aged 4 to 7 years, there is much to thrill and interest younger children, too. Additional reviews, a book trailer, and information about the author are also available on Kraegel’s personal website. Moving to a new place is never easy, and when the language and customs don’t make any sense, feeling at home there seems almost impossible. Patti Kim and Sonia Sánchez’s wordless picture book brings a little boy and his family to the United States. While the rest of his family is a little more open to making a go of this new life, the boy is frustrated and intimidated by the strangeness of everything. He retreats into himself, watching the world from behind (safe) apartment windows and longing for home. This desire for “home” is at first centred in a red seed that the boy has brought with him. Gradually, though, the meaning of the seed changes, from a reminder of another place to simply the possibility of growth. When the boy loses his seed, he sets off after it, and quickly discovers, as he wanders his new neighbourhood, that this place is full of interesting things and friendly people. While he does eventually find the seed, the boy has by that time grown confident enough to be friendly himself. He and the little girl who found the seed plant it, and as it grows, so does their friendship, including first his sister, then her brother, and eventually both children’s parents as well. 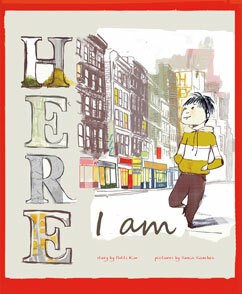 Here I Am is a lovely, contemplative story. The images do a wonderful job of helping the reader to feel the strangeness of a new place for themselves, in particular through the spoken and written language that surrounds the boy, depicted in “bla-bla-blas” and mingled letters and symbols from a variety of alphabets. 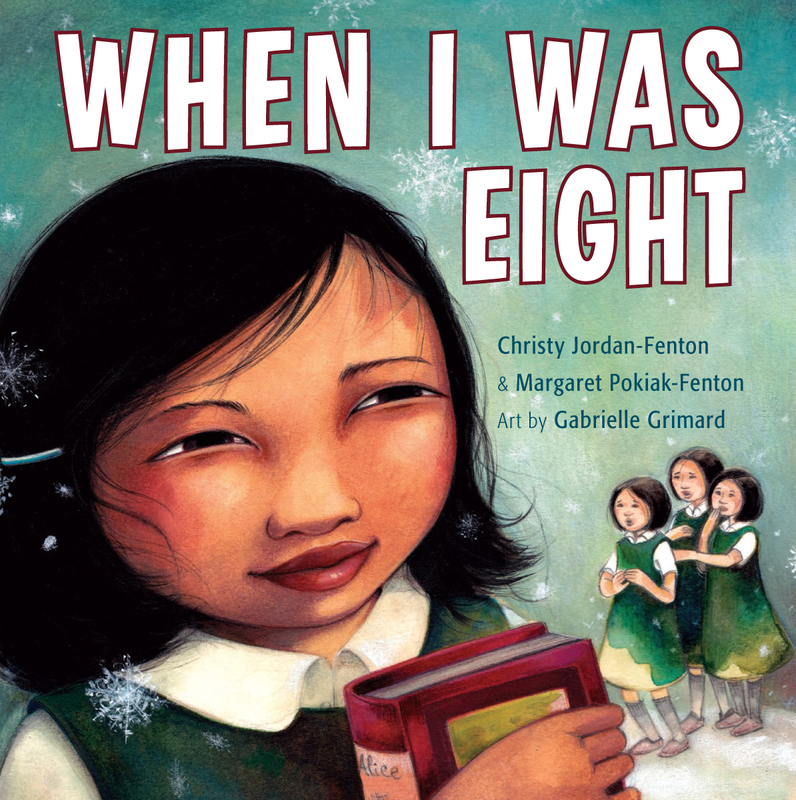 The book is as valuable for young readers welcoming new immigrants into their classroom or community as for new immigrants themselves, with its focus on understanding, courage, and finding universal means of communication. Read more reviews from Book Egg and A Lovely Bookshelf on the Wall. 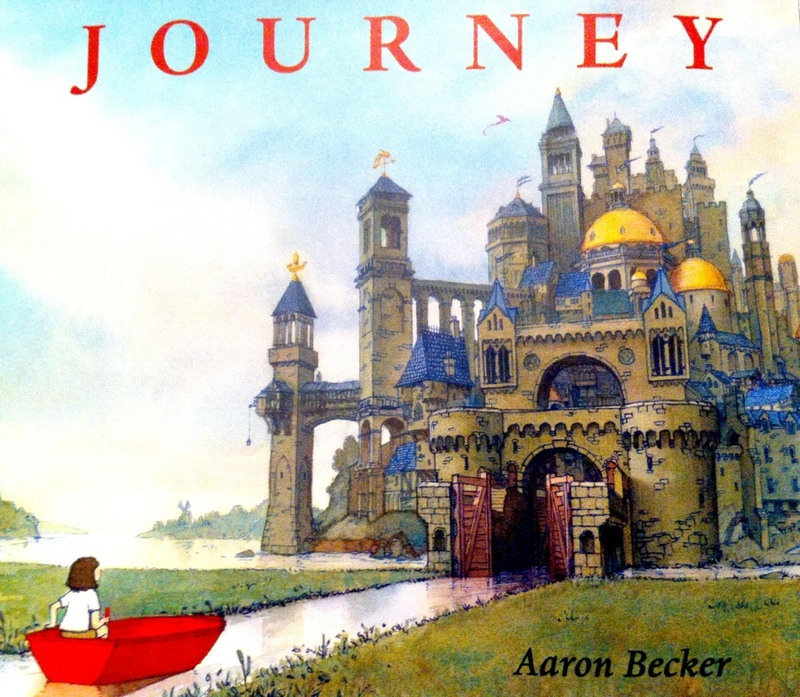 Ever wonder how an author composes a wordless book when she/he is not the illustrator? Check out this interview on Capstone Connect to find out how Patti Kim did it! Releases September 2, 2013. 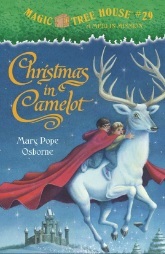 Thanks to Capstone Kids and NetGalley for the review copy!